July 5 - Tickets for the Makkah Metro (also known as Mashair Metro) will be distributed during October, more than a month before Haj, said the Chairman of the Haj and Umrah Committee Sa’ad Jameel Al Qurashi at the Makkah Chamber of Commerce and Industry. 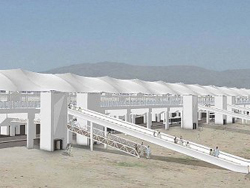 “The tickets will be evenly distributed among Mutawifeen [Hajj service providers] and during the next pilgrimage, the Metro is expected to transport about 130,000 pilgrims representing about 35 per cent of its total capacity,” Al Qurashi said. He added that only pilgrims from within Saudi Arabia and the Arab Gulf countries will be able to use the Metro initially, explaining that 12 out of the train’s 20 cars would be operated initially. The 12 cars would together carry 3,000 passengers on each trip, he said adding that, when in full swing, the Metro would carry about 72,000 passengers per trip. “The actual price of tickets has not been decided yet but it is expected to be around 90 Saudi riyals,” he said.